Nominate for the 2018 Prospect Awards. 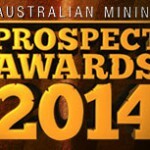 The 2018 Australian Mining Prospect Awards is fast approaching, with nominations open to the industry. Last year’s winners range from SMEs and start-up ventures to the biggest in Australia’s mining industry, including Gina Rinehart and BGC Contracting. There are 13 award categories in total – 12 of these are open for public nominations. They are Safety Advocate Award; Community Interaction; Contract Miner of the Year; Contribution to Mining; Hard Rock Mine of the Year; Coal Mine of the Year; Excellence in Environmental Management; Excellence in Mine Safety, OH&S; Minerals Processing of the Year; Innovate Mining Solution; Mine Manager of the Year; as well as Lifetime Achievement Award. Celebrating its 15th year of recognising the best of the best in the industry, the Prospect Awards will take to the stage at the Sydney Cricket Ground on Thursday October 18.